The Scottish Cup has ended a year without a sponsor after the Scottish Football Association agreed a "seven-figure deal" with William Hill. 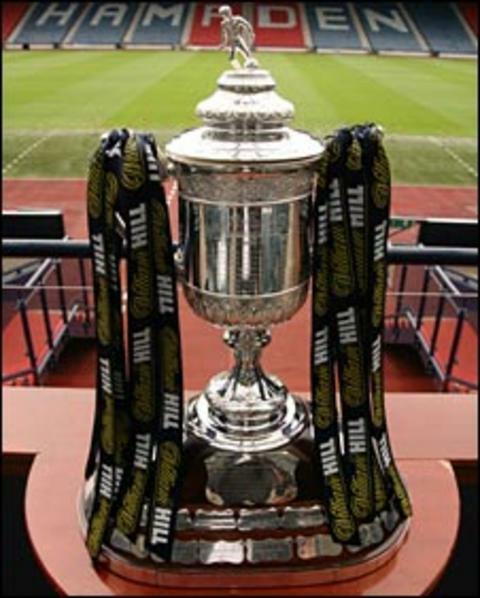 The three-year partnership with the UK bookmaker means the competition will be renamed the William Hill Scottish Cup. Scottish FA chief executive Stewart Regan said: "We are proud to have a leading brand like William Hill as sponsor of the Scottish Cup. "We can now look forward to another exciting season ahead." The deal should net the SFA about £1m per year and is the first time the Scottish Cup has had a commercial sponsor since Tennents Lager ended its eight-year association with the competition in 2007. Since then, the cup has either been subsidised by the SFA itself or the Scottish Government through its Homecoming Scotland and Active Nation branding. William Hill is already the official betting partner of the Scottish Premier League and also sponsors Scotland's richest horse race, the William Hill Ayr Gold Cup. And company chairman Gareth Davis said: "It seems fitting for the most established and biggest bookmaker in Scotland to be attached to the oldest association trophy in world football and we at William Hill consider it an honour to be able to put our name to the Scottish Cup." The draw for the first round of the William Hill will take place in Glasgow's Buchanan Galleries Shopping Centre on Monday morning. Last year's victorious captain, Celtic midfielder Scott Brown, SFA president Campbell Ogilvie and William Hill Group brand and marketing director Kristof Fahy will pick the names out the hat for the matches to be played on Saturday 24 September.